In microbiology, the minimum inhibitory concentration (MIC) is the lowest concentration of a chemical that prevents visible growth of a bacterium (in other words, at which it has bacteriostatic activity), whereas the minimum bactericidal concentration (MBC) is the concentration that results in microbial death (In other words, the concentration at which it is bactericidal). The MIC of a chemical is determined by preparing solutions of the chemical at increasing concentrations, incubating the solutions with the separate batches of cultured bacteria, and measuring the results using agar dilution or broth microdilution, usually following the guidelines of a reference body such as the CLSI, BSAC or EUCAST (European Committee on Antimicrobial Susceptibility Testing). In medicine, culturing the organism infecting a patient with available antibiotic drugs and determining the MICs, is important for identifying the correct drug to actually give to the patient. The first step in drug discovery programs is often the screening of a library drug candidates for MICs against bacteria of interest. As such, MICs are usually the starting point for larger preclinical evaluations of novel antimicrobial agents. Minimum Inhibitory Concentration: Tube Dilution Assay is performed by constantly increasing the percent concentration of antimicrobial agent to microbial rich broth in a series of tubes. It is used to measure the Minimum Inhibitory Concentration [MIC] of an antimicrobial agent, which is the lowest concentration of antimicrobial agent that will inhibit the growth of microbes. 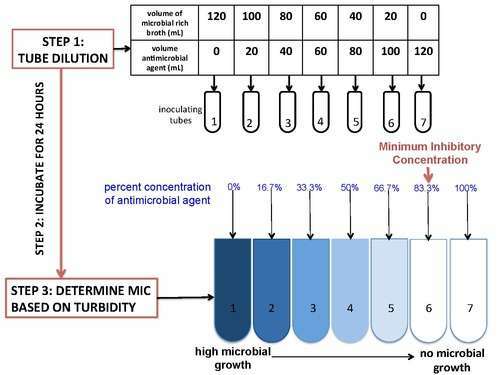 The turbidity of the tubes indicates the amount of microbe growth, with the least turbid, or clear, tubes (tubes 6 and 7) correlating with the absence of microbes. The tube with no antimicrobial agent (tube 1) presents as opaque and most turbid because the microbes are able to flourish. As antimicrobial concentration increases, the turbidity decreases until the MIC is reached and microbes can no longer survive. Antimicrobials with low MICs are more effective than those with high MICs, as only a low dosage is necessary to eradicate microbes. ↑ Tripathi, K.D. (2013). Essentials of Medical Pharmacology (7th ed.). New Delhi, India: Jaypee Brothers Medical Publishers. pp. 696,697. 1 2 Andrews, J. M. (1 July 2001). "Determination of minimum inhibitory concentrations". Journal of Antimicrobial Chemotherapy. 48 (suppl 1): 5–16. doi:10.1093/jac/48.suppl_1.5. PMID 11420333. ↑ O'Neill, AJ; Chopra, I (August 2004). "Preclinical evaluation of novel antibacterial agents by microbiological and molecular techniques.". Expert Opinion on Investigational Drugs. 13 (8): 1045–63. doi:10.1517/13543784.13.8.1045. PMID 15268641.